When one agency or program thrives, we all thrive. Most importantly: Young people thrive. Across Canada September is Big Brothers Big Sisters Month and September Tuesday, Sptember 18th is Big Brothers Big Sisters day across Canada. We know that the work of thousands of Big Brothers and Big Sisters have helped young people thrive, and for that we celebrate their successes. WWe are grateful for the numrous contributions Big Brothers Big Sisters has made to the Alberta Mentoring Partnership. From lending us our AMP Co-Chair Liz O’Neill from the Edmonton agency, to volnteers for committees, research, and actions from across Alberta, we are thankful that the BBBS Movement in Alberta has lent generously of their time talent and treasure in support of the tools and resources of the mentoring movment. Let’s keep growing! Big Brothers Big Sisters is only available in certain communities in Alberta. That means we need to support new and improve community based mentoring programs through our START A COMMUNITY BASED MENTORING PROGAM TOOLKIT or our FRAMEWORK FOR BUILDING MENTORING RELATIONSHIPS IN SCHOOLS. Get Started Mentoring Today – Because it Make a Difference in a Kids Life! What are Some Fun Activities with Mentors and Mentees? What is Being a Mentor Like? What’s Being a Mentor Like? It’s a Fun Commitment! oin Doug Tweddle for an interview with the AMP team and an exclusive Q&A to ask your questions about insurance. All mentoring programs undertake substantial risk simply due to the nature of the services being provided. A program has a duty of care to its participants, and could be held liable if harm comes to a child, youth or volunteer as a result of accident, injury or abuse. 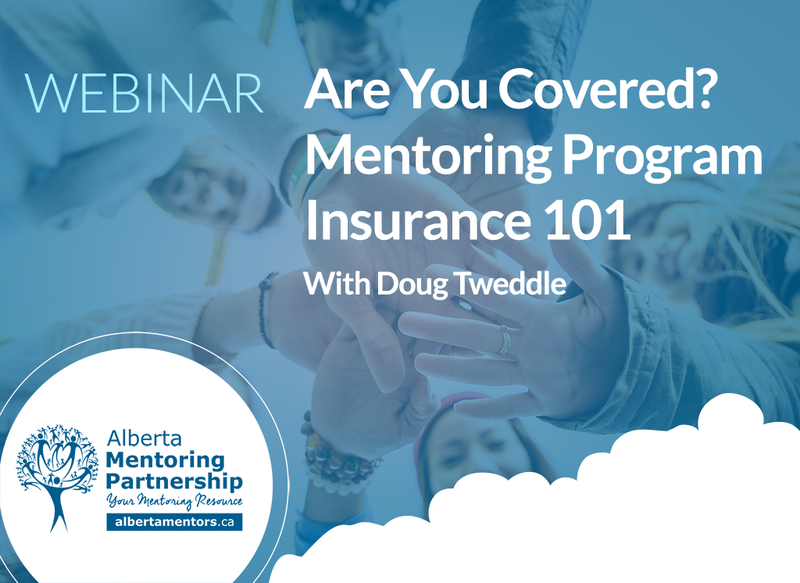 As such, every mentoring program requires some sort of liability insurance. Are you covered? In many cases, one of the partners working to deliver the program will have a comprehensive policy that covers the risks associated with that program. minimize risks through screening, training and on-going supervision and to seek legal or professional advice about sufficient coverage before you begin to implement your program. Call a reputable insurance agency to explore your insurance needs. We invite you to join our second….Are you looking at exploring innovative ways to recruit volunteers, fundraise, and grow your mentoring program? To RSVP Here: E-Mail Michal Janz – michael.janz@albertamentors.ca with your name, agency and position. Dial in, share your story and participate in a “share and care” with other marketing professionals in the mentoring community. What is a stress that you are encountering? What is an opportunity on the horizon? A chance to respond to the above with other members on the call. Not sure what to share? Themes could include celebrating diversity, volunteer recruitment, trends, tactics, tools, etc for promoting mentoring, friendraising and fundraising. Making Program to program connections will be key to building regional capacity and establishing local relationships, especially for the rural and remote.